Presidents, like kings, lead cloistered lives. Protecting the president from too much isolation are advisers and aides who help ensure that the administration achieves its policy goals while enjoying broad political support. In economics and environmental policy, where disagreement among stakeholders and expert opinion is especially strong, the president needs good advice about political strategy, as well as unbiased information about the substance of policy issues. It is the latter need that the Council of Economic Advisers (CEA) is intended to address. 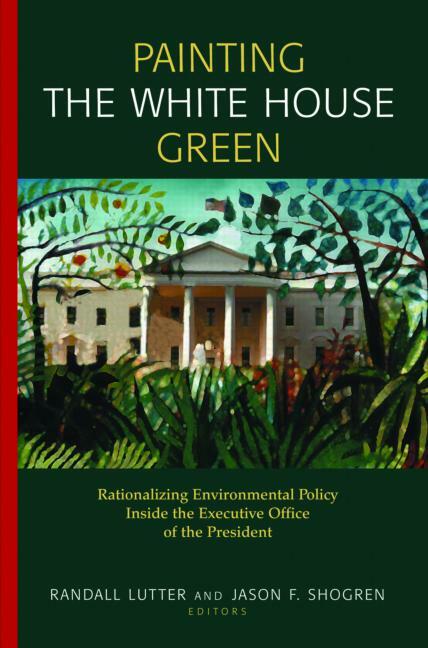 Painting the White House Green collects personal essays by eight Senior Staff Economists for Environmental and Natural Resource Policy who worked within the CEA from 1992 to 2002. These authors confirm the council's 'severe' view of many environmental initiatives, a perspective that led President Clinton to label his economic advisers as 'lemon suckers.' At the same time, they demonstrate that the emphasis on efficiency was to offer more effective environmental protection at lower cost. Thinking 'green' meant thinking consistently about both economics and the environment. The essays in this innovative book present lively debates on clean air, climate change, and electricity deregulation that pitted economists at CEA, the Office of Management and Budget, and often the Treasury Department, against political advisers in the White House and officials at EPA and other agencies. The essays present vivid portraits of the power plays involved in environmental policymaking, rare insights into presidential decisionmaking, and revealing details of the ways that economic thinking influences-or is neglected-in a wide range of policy decisions. Randall Lutter is chief economist with the U.S. Food and Drug Administration. Jason F. Shogren is the Stroock Distinguished Professor of Natural Resource Conservation and Management and a professor of economics at the University of Wyoming.